While traveling to China we wanted to try every kind of food possible. So I was really excited when I stumbled across an article on TimeOut Shanghai about alternative Shanghai tours, which included a write up on culinary tours with UnTour Shanghai. Looking back I am very thankful we planned food tours in both Beijing and Shanghai, because they introduced us to so many different foods and experiences I don’t think we would have had otherwise. 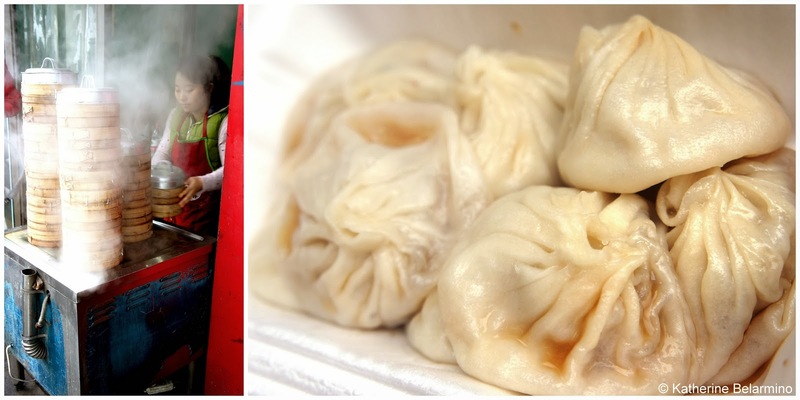 UnTour Shanghai offers a variety of Shanghai food tours, including Oodles of Noodles, Street Eats Breakfast, Dumpling Delights, Street Eats Night Markets, Vegetarian Voyage, and Hands-On Dumpling Delights. The first task was figuring out which of these tours we wanted to try. We opted for Street Eats Breakfast. It meant waking up early, but I just knew it was going to be worth it, and it was. Our Shanghai food tour started by meeting at Xiangyang Park at eight o’clock in the morning. Xiangyang Park is a pretty little patch of green park where the locals go for their morning exercise. There was a slight drizzle that morning, so we didn’t get to see the water calligraphers, who apparently occasionally have heated discussions about which style of water calligraphy is best. But we did get to see a group of Shanghai locals practicing Tai Chi. Tai Chi at Xiangyang Park. Before tasting our first course, we walked around Xiangyang Park for a bit of a cultural lesson. Our tour guide Monica, an American expat who has lived and worked in Shanghai for years, guided us to a colorful chalkboard in the park which detailed the fruits and vegetables that were fresh at the time and also listed their various health benefits. Xiangyang Park is for all things health, including exercising, reading about healthy foods, and talking about health. Monica explains the Xiangyang Park chalkboard of health. Our first food stop on our culinary tour was the Xiangyang food stalls where we picked up a number of bready treats and crunchy sweets. Chinese flatbread is called bing, and the big ones are called dabing. We had dabing with egg and scallions, which surprised us all with its flavor. The dabing was like a thin, handheld Chinese omelet. Dabing at Xiangyang food stalls. One of my favorite discoveries was Chinese brittle, called fah sung thong, made with black sesame seeds, peanuts, or a mixture of both. We had seen these earlier being sold at street stands, but didn’t know what they were. If you see them while walking around, buy them! They just aren’t the same when purchased packaged rather than fresh from street vendors. Believe me; I bought the packaged ones at the airport because I just didn’t get enough. They weren’t even close. Chinese brittle made with peanuts and sesame seeds. Delicious! We also had our first round of delicious dumplings with chili sauce and the perfect vinegar. We learned that each type of dumpling has its own vinegar that pairs with it best. We moved on to a stand making fresh jianbing, a Chinese crepe. Jianbing is a typical snack found in the western bread basket regions like the Hunan province. The making of jianbing is a fascinating process requiring speed and skill. A thin large crepe is created onto which an egg is cracked. Then pickled mustard greens, cilantro, green onions, fermented bean paste, dried chilis, and fried wonton sheets are added, and the jianbing is rolled into a burrito shape. I almost turned it down because it looked so filling, but I’m glad Monica talked me into eating one. Jianbing is actually surprisingly light for its size, and so good! The flavor combination of the soybean paste and chili plus the fresh greens and the crunch made for a fun treat. Video from our UnTour Shanghai food tour, including the making of Jianbing. We walked off some of our breakfast food while exploring the alleys of Shanghai on our way to try Henan pulled noodles. Here we witnessed the art of making fresh pulled noodles before heading up the steep, short wooden stairs to the small dining area. The noodles were simple with caramelized onions that added a pop of flavor. A really surprising dish that I probably never would have tried if it hadn’t been for our UnTour Shanghai culinary tour was dried tofu with green peppers, red onions and chilies. Dried tofu doesn’t sound all that appetizing, but it is a thousand times better than it sounds and has a pleasing hearty texture. Dried tofu with green peppers. Our Shanghai food tour moved on, this time to visit the Donghu Wet Market. We walked through the wet market to look at all the stands of fresh fruit, vegetables, seafood and meat products. This beautiful lady saw me taking pictures of all the food and pantomimed for me to take a picture of her and her infectious smile. Vegetable vendor at Donghu Wet Market. We ambled along the streets of Shanghai and stopped at a roasted chestnut stand. You’ve probably seen chestnuts sold on the street before. I’m used to seeing the large chestnuts like those they sell in New York. These were much smaller and had a deeper toasted, sweet taste with a far less grainy texture. Our next stop was for one of the advertised highlights of the Shanghai culinary tour, soup dumplings. These aren’t the large soup dumplings often shown on television, served with a straw. These are a smaller, more delicate dumpling, and oh so good. A cube of meat stock is wrapped with meat into delicate dumpling wrappers before being steamed. The trick to eating these treats is to turn them over and take a small bite of the bottom, then blow into the hole to cool the dumpling a bit. Then the remainder of the juicy soup dumpling can be tossed into your mouth and enjoyed, again with the obligatory vinegar accompaniment. Hot and juicy soup dumplings. We had one last stop which was completely unexpected and practically brought me to tears. For our entire trip through China I had been looking for the egg tarts of which I had read while planning, but I hadn’t come across any. I was devastated I would be going home without trying what seemed to be a signature Chinese dessert. But then Monica led us to Lillian Bakery, where she promised they make the best egg tarts in Shanghai. They have two varieties, the original recipe and the cheesecake hybrid. Stick with the original. The palm sized custards are served warm, straight from the oven, and have a flaky puff pastry crust and a sweet, smooth, custard filling. Lillian Bakery’s egg tarts were so delectable we went back the next day . . . twice. There are a few Lillian Bakery locations in Shanghai, but Monica said this location was the best, plus it is easily accessible in the metro line 10 South Shaanxi Road station. One of the best desserts in the world, an egg tart from Lillian Bakery. So ended our Shanghai food tour, leaving us happy and full, as well as educated on all sorts of Chinese breakfast foods we may never have tried otherwise. 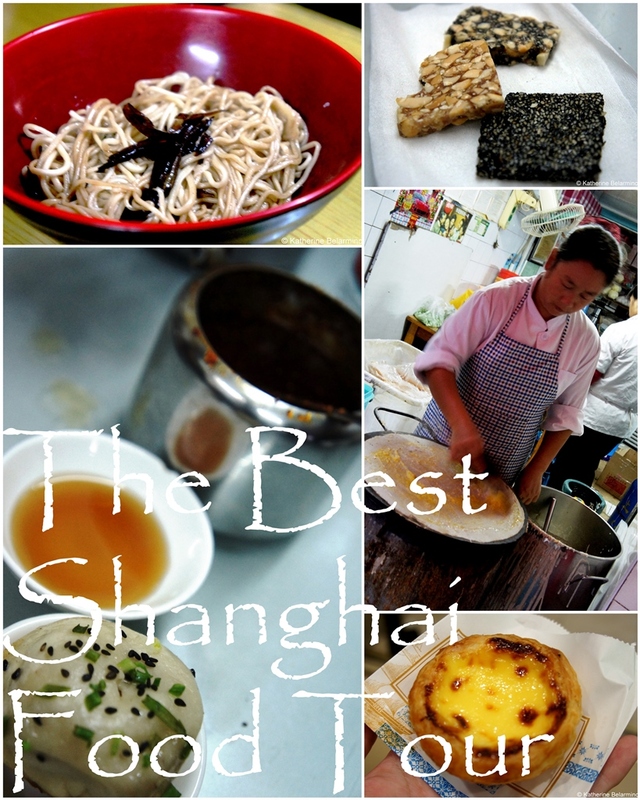 If you are looking for things to do in Shanghai, add a food tour with UnTour Shanghai to your itinerary. As UnTour Shanghai’s website aptly promises, their Shanghai food tours are “culinary adventures for the hungry foodie who wants to taste it all.” And we did taste it all. Thank you to UnTour Shanghai for a wonderful breakfast food tour and for providing us with a discounted media rate. As always, all opinions are my own. They did not bribe me with extra egg tarts to write nice things. Update: UnTour has expanded and now offers food tours in Beijing too.